In December of 2011, the World Mission Society Church of God (WMSCOG) filed a $25 million lawsuit against the owner of this website and a former member claiming defamation among other things. Below are the relevant court documents. As you know, everything posted here on examiningthewmscog.com is well researched, well cited, and truthful to the best of my abilities (if it were not, it would be promptly corrected). More documents will be posted as they become available. On 07/20/12, the Court issued the following written opinion and order concerning the WMSCOG’s Motion for Protective Order filed on 06/20/12. You may view it in PDF or text format below. 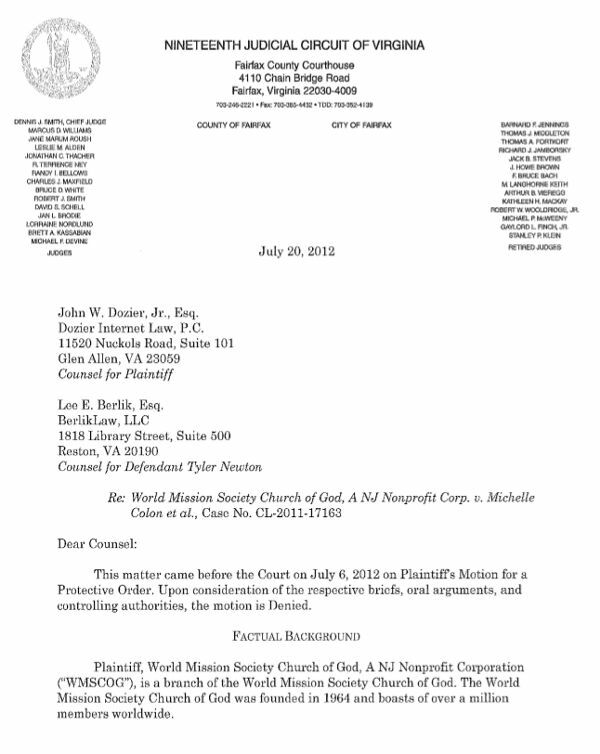 This matter Came before the Court on July 6, 2012 on Plaintiffs Motion for a Protective Order. Upon consideration of the respective briefs, oral arguments, and controlling authorities, the motion is Denied. Plaintiff, World Mission Society Church of God, A NJ Nonprofit Corporation (“WMSCOG”), is a branch of the World Mission Society Church of God. The World Mission Society Church of God was founded in 1964 and boasts of over a million members Worldwide. 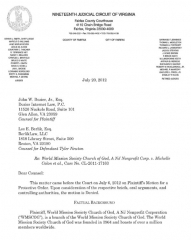 In June of 2011, defendants Michelle Colon1 and Tyler J. Newton (“Newton”) began a series of purportedly defamatory attacks against WMSCOG. Newton allegedly created a Facebook group and YouTube Videos for the purposes of attacking WMSCOG. Additionally, Newton operates an Internet website (“Website”) that criticizes WMSCOG2. The Website discusses the World Mission Society Church of God’s teachings, methods, and practices and monitors the World Mission Society Church of God’s Worldwide activities. A number of allegedly defamatory statements on the Website are enumerated in WMSCOG’s complaint. Representative examples of the defamation complained of include allegations of money laundering, intentional destruction of families, deception, intimidation, misappropriation of finances, and improper financial relationships between secular Corporations, the WMSCOG and its senior leadership. In response to the perceived defamation, WMSCOG filed a complaint against Colon and Newton with claims for defamation, statutory conspiracy, civil conspiracy, trade libel, tortious interference with a business expectancy, and negligent interference with a business expectancy3. WMSCOG requested a permanent injunction requiring the removal of all purportedly defamatory material posted on the Internet. WMSCOG requested compensatory damages of five million dollars and requested the compensatory damages be trebled in accordance With Virginia Code §18.2-500. WMSCOG additionally requested a punitive damages award of ten million dollars. Pursuant to Rule 4:1 of the Rules of the Supreme Court of Virginia, Newton propounded written interrogatories and requests for production of documents on WMSCOG. WMSCOG generally refused to respond to Newton’s discovery requests and stated that it would not fully respond until a protective order was entered. WMSCOG predicates its request for a protective order entirely upon its concern that Newton will publish on the Website any disoovery materials obtained. WMSCOG asserts the sole purpose of discovery is to allow parties to prepare for trial, and Newton should not be permitted to share discovery information with the public. WMSCOG contends Newton should be entirely precluded from taking any discovery in the matter. lf Newton is permitted discovery, WMSCOG requests the discretion to classify materials as confidential and only viewable by counsel. 1 Colon’s Motion to Dismiss for lack of jurisdiction was granted by Judge Bellows on March 16, 2012. 3 Judge Brodie sustained Newton’s demurrer to the tortious interference with a business expectancy and negligent interference with a business expectancy on March 13, 2012. Newton concurs with WMSCOG’s conclusion that the sole purpose of discovery is preparation for trial. Newton subsequently lists sixteen specific allegations of defamation listed in the Complaint and argues he is entitled to discovery with respect to each of the allegations and all other claims made in WMSCOG’s Complaint. Newton further contends WMSCOG has not articulated a particularized harm that would occur in the absence of the issuance of a protective order and argues a fear of public dissemination of discovery materials is insufficient to allege good cause. Although Newton requests unredacted discovery materials, Newton represents all identifying personal information of third parties will be redacted prior to publication. The issuance of protective orders is governed by Rule 4:1(c) of the Rules of the Supreme Court of Virginia. According to Rule 4:1(c), a protective order may be granted upon motion and a demonstration of good cause. VA. SUP. CT. R. 4:1(c). Virginia courts have not articulated good cause in this context. Virginia’s Rule 4:1(c) and Rule 26(c) of the Federal Rule of Civil Procedure are substantially similar with respect to the demonstrations necessary to grant a protective order4. Therefore, this Court will examine the federal standards applied to protective orders for guidance. When applying Rule 26(c) of the Federal Rules of Civil Procedure, federal district courts have concluded the issuance of a protective order requires both an allegation of significant harm and a demonstration of good cause. Trans. Pacific Ins. Co. v. Trans-Pacific Ins. C0., 136 F.R.D. 385 (E.D. Pa. 1991). Furthermore, the significant harm must be demonstrated by specific factual assertions. United States v. Garrett, 571 F.2d 1323, 1326 n.8 (5th Cir. 1978). In Virginia, parties may properly issue with respect to any relevant issue that is not otherwise privileged. VA. SUP. CT. R. 4:1(b)(1). Even if the discovery requested would not be admissible at trial, a discovery request is not improper if it would lead to the discovery of admissible information. Id. To obtain such discovery, parties are permitted to utilize methods such as interrogatories, depositions, and requests for production of documents. VA. SUP. CT. R. 4:1 (a). The sole justification for obtaining discovery is to assist parties with trial preparation. Shenandoah Publ. House v. Fanning, 235 Va. 253, 260, 368 S.E.2d 253, 256 (1988)(citing Seattle Times Co. v. Rhinehart, 467 U.S. 20, 34-36 (1984)). 4 Under the Federal rules, a protective may be granted “for good cause […] to protect a party or person.” FED. R. CIV. P. 26(c)(1). It cannot logically be the case that good cause exists to prohibit the public disclosure of discovery materials because a party states an intent to disseminate those materials in accordance with the law. […] To show good cause, a party must demonstrate more than that an opposing party intends to disseminate discovery materials; rather, it must show that the disclosure of those materials will cause specific prejudice or harm, such as annoyance, embarrassment, oppression, or undue burden or expense. And, importantly, the fact that public disclosure of discovery materials will cause some annoyance or embarrassment is not sufficient to warrant a protective order; the annoyance or embarrassment must be serious. 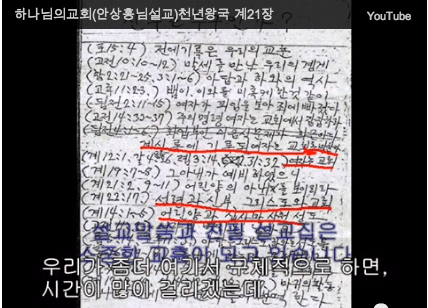 WMSCOG filed its Complaint and specifically enumerated sixteen defamatory statements Newton had purportedly made. Generally, Newton’s interrogatories and requests for production of documents directly address the defamatory statements WMSCOG chose to be the predicate of its Complaint. The discovery propounded clearly seeks to obtain relevant and otherwise discoverable information. WMSCOG lodges a number of objections and purported classifications of confidential information with respect to Newton’s discovery; however, WMSCOG predicates its assertion of good cause entirely upon the possibility Newton will publish discovery material obtained on the Website. The only harm WMSCOG references are amorphous “threats” and that could befall the church and its members if Newton is permitted to publish discovery materials. Vague apprehensions with respect to potential publication are insufficient to demonstrate the requisite good cause necessary to issue a protective order. WMSCOG failed to articulate a single serious harm to occur if Newton publishes the discovery material he obtains. Any annoyance or embarrassment WMSCOG suffers is directly related both to WMSCOG’s decision to institute the current action and the extensive scope of the allegations propounded against Newton. The only embarrassment to members of the church will be a result only of their membership in WMSCOG5. Neither of these concerns justify issuing a protective order. Accordingly, WMSCOG failed to demonstrate any good cause sufficient to issue a protective order. The motion for a protective order is DENIED. 5 Newton requested that any order granted with respect to WMSCOG’s motion for a protoctive order contain a provision that all third ­party identifying information beyond names obtained through discovery will be redacted by prior to any publication, and the Order will reflect Newton’s request. It is further ORDERED that the Letter Opinion of July 20, 2012, is incorporated into this Order. lt is further ORDERED that all discovery produced in this matter shall be produced in unredcated form. Prior to either party’s publication of discovery materials all “personal information” of third parties shall be redacted. “Personal information” is defined to include social security numbers, phone numbers, home addresses, and email addresses. It is further ORDERED that Plaintiff respond to Newton’s interrogatories and request for production of documents within fourteen (14) days of the entry of this Order. Entered on this 20 day of July, 2012. 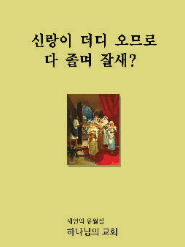 Today, I was approached by a Korean as I was coming back from work. For some reason, I decided to do his survey. I was a little surprised to see that it (apparently) was about Christianity, because it asked questions that at a shallow glance would seem to be used by Christians to initiate outreach. They were questions such as “Did you know that Jesus commanded us to celebrate the Passover in order to receive eternal life?” and “Do you know what 666 means?”. Then the questions got a little strange to me. Next up was “Do you know what Jesus’ name will be when He comes again?”, “Do you know that Jesus second coming will be from the east?” and “Have you ever heard of the Heavenly Mother?”. Red flags went off. Steven goes on to explain that mind control is a tool that destructive groups use in order to manipulate members and create a new identity where the “locus of control” is no longer within the individual. Through his many years of research, Steven developed a tool called the BITE Model which is used in order to help determine if a particular group is a destructive mind control group.